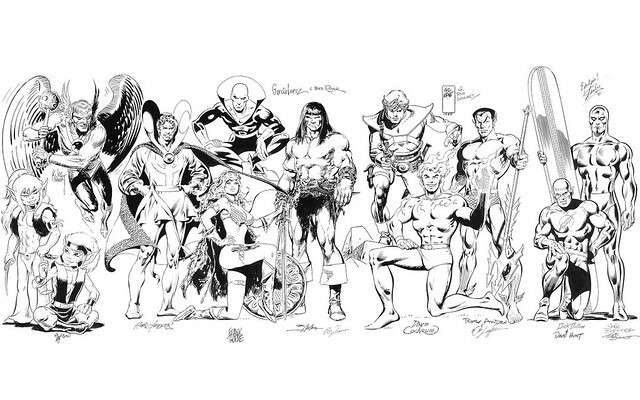 Giant-Size Geek: Buscema, Adams, Kubert, Garcia-Lopez, Kane on a Silver-Bronze Age Jam! Buscema, Adams, Kubert, Garcia-Lopez, Kane on a Silver-Bronze Age Jam! I love finding comic art jams where a die-hard fan was able to get the most famous comic artists to draw characters together in one big illustration. Last year I featured one with Wrightson, Ditko, Infantino and many more great artists. Gil Kane - John Carter, Warlord of Mars Gulliver Jones, Warrior of Mars! An impressive piece! Martin Greim has to have been the original owner. The fact that the owner got these inkers is also remarkable. Who knew Bob Layton inking Ross Andru would be such a great combination? Nuff Said! This is great, Richard! Thanks for sharing. By the way, Buscema rejects every ounce of tutelage he gave in the "How to Draw Comics..." book, doesn't he? That's a pretty bland image of ol' Norrin Radd! Doug, agreed, I had to do a double-take myself on the Buscema Surfer. After enlarging it, I think it's the face and the shape of the head that are throwing me off. A Buscema/Sinnott Surfer is pretty distinctive, but it seems either one or both of these artists adjusted their style a bit here. Dave Cockrum's drawing is the Golden Age Human Torch. Cockrum previously drew the character in Giant-Size Avengers #3 just a few years earlier. Doug, yes the Buscema drawing is a bit lame...but at least the collector had Sinnott ink it! Richard, thanks for the tip on the Torch! Richard, that's not John Carter but Lt. Gulliver Jones of Mars. Kane worked on his too, for Marvel. Also as a character, he predates John Carter.